I've been told I have surfer's ear. What does this mean and will it affect my diving? An exostosis is a narrowing of the inner half or the bony part of the circular outer ear canal by bony swellings. These localized bony swellings grow slowly over a period of years in response to the irritation of cold water on the skin of the outer ear canal. They are called swimmer’s nodes and are common in the surfing community. When the medical examination reveals early development of, or there is an established exostosis, it is important that measures are taken to prevent the continued growth of the exostosis. If swimming in non-tropical waters a hood should always be worn, or for surface swimmer’s only, some form of ear plug should be used. The narrowed era canal is more prone to blockage by wax or debris, and more susceptible to otitis externa. An exostosis on the floor of the ear canal can form a sump which retains moisture and predisposes it to infection. 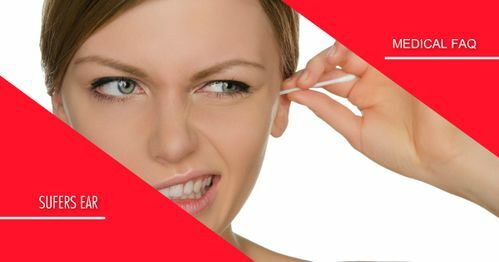 If ears have a natural tendency to occlude with wax, have them checked regularly, particularly before a prolonged diving trip. Instill a couple of drops of 5% acetic acid (vinegar) in 60% ethyl alcohol (rubbing alcohol suffices) into both ears. You may use a commercial solution like Otic Domeboro (prescription only) to treat your ears after every dive or exposure to water. If very prone to ear infections, blow warm air into external canal using a hair dryer. There is no specific risk for diving. It is recommended to have surgical removal if there is associated hearing loss or repetitive infections of the outer ear.